To the Editor: The Department of Medicine at the University of Cape Town (UCT) has recently celebrated 90 years of its existence. The first Professor of Medicine, Professor A W 'Oubaas' Falconer, from Aberdeen, Scotland, established the then Division of Medicine at the new UCT Medical School in February 1920. He contributed greatly to the establishment of clinical teaching, then at Somerset Hospital.1 In 1938 Groote Schuur Hospital (GSH) opened, at which time Falconer retired as Professor of Medicine to become Vice-Chancellor and Principal of UCT. Professor Stuart Saunders succeeded Brock in 1971 and successfully steered the Department through turbulent times. Professor Bill Hoffenberg was banned for his anti-apartheid activities in 1968 and went into exile. The political repression and unrest of the 1970s significantly impacted on the life and work of the Department, resulting in a major exodus of highly qualified staff in 1977 and 1978 after the 1976 uprisings of schoolchildren against Bantu education. Chronic health care budget cuts and the flight of staff into the private sector or overseas continued in the era of Professor Solomon Benatar from 1981 to 1999. Professor Benatar stabilised the Department amid an increasingly hostile funding environment. Professor Ralph Kirsch succeeded him in 1999 in a Department that was sound with respect to the quality of clinical teaching, medical service and research output. 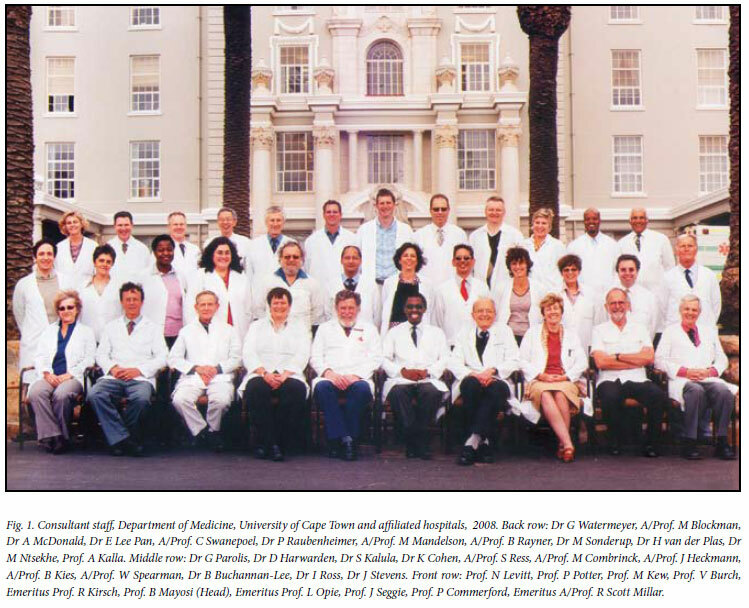 In 2006, as the seventh Head, I inherited one of the finest Departments of Medicine in Africa, a tribute to the fighting spirit of Ralph Kirsch and his predecessors in ensuring the survival of academic medicine in Cape Town under difficult conditions.3 Today the Department has talented and dedicated men and women who are committed to providing the best clinical care to their patients, produce competent doctors and specialists, and conduct research of international quality (Fig. 1) (also see www.medicine.uct.ac.za). Over the past four years the Department has transformed to meet the formidable health needs of South Africans.4 A larger and stronger Department is required to meet the challenges of a rising disease burden and shortage of health professionals in South Africa. Through active fundraising from public and private sources, the full time academic teaching staff (professors, associate professors, senior lecturers and registrars) has increased by 37% from 109 in 2005 to 149, and the proportion of black academic staff has increased to nearly 50%. The new Department of Higher Education and Training clinical training grant enabled us to appoint 20 new senior specialists to assist in teaching undergraduate and postgraduate students. The link between 'town and gown' has been restored by bringing experienced private sector colleagues back into university clinical teaching. The Department increased its publications, which peaked at 250 in 2009, and the number of National Research Foundation-rated researchers increased from five in 2005 to 16 in 2009 (three A-rated), heralding the Department's renaissance.